Figuring out where to put the bathrooms in your new home might seem like a minor matter. Isn’t it just deciding how many and which bedrooms get their own or have to share? That’s oversimplifying things. Bathrooms ought to be more than an afterthought. Start with the number. Most timber-home buyers today agree they’ll need at least two, likely three. But are four bathrooms too many—or still not enough? When fewer won’t do, more may pose a puzzle. The solution falls in between each up-or-down whole number: half-baths. These odd little spaces are convenient and versatile. Another term for half-baths is “powder rooms.” That term dates to dandier times, before indoor plumbing, when wig-wearers ducked into hall closets to powder their headwear. Simple closets made do with a table, chair and mirror. Plumbing brought sinks, then, as long as you’re sitting down anyway, a toilet. The name stuck. People usually aren’t in a half-bath long enough to need a tub, though some today have showers. Others share space and plumbing with washers and dryers, and the sink might involve more after-chores clean-up than primping. Functionally, though, all half-baths are strategically placed pit stops. Don’t do half-baths halfway, however. Half-baths fail when you realize after you’ve moved into your home that they aren’t as practical as you’d envisioned. So plan them purposefully, preferably before the plumbing contractor puts in the pipes. Do you even need a half-bath? Some homes do well with only full bathrooms. If you don’t want party guests climbing stairs or tramping through bedrooms to use the bathroom, then your layout calls for a powder room. But half-baths aren’t just for company. Even family members may find them useful, especially in larger homes where the full baths near bedrooms are far away, or up a flight of stairs. Half-baths can prove economical in smaller homes. Cluster kid rooms and guest bedrooms near a powder room to provide all but the shower and tub, and when they’re needed, folks can take turns in the nearest full bath. Meanwhile, this half-bath should have room for toothbrushes and toiletries, shelves and hangers, and whatever else helps the room work. Half-baths tend to go where guests gather. Between the kitchen and living room is handy, but any central location works. If you have a loft that you use for sitting or hobbies or a home office without a bedroom, an upper level half-bath saves going down stairs. Half baths aren’t usually grouped with full baths, although some plans show half-baths and full baths adjacent for efficiency of space or plumbing. Because half-baths need less of both, they do well being off by themselves. If you could as easily reach a half-bath as a full-bath, you may not need a half-bath at all. Rather than carve out space for a half-bath, look for dead space. Beneath stairs is a popular choice. Make the room accessible, but if possible tuck the door out of sight to give the room some privacy. Don’t confine half-baths to guests’ use. They’re handy for lofts, basement or garage workshops, next to a mudroom or another entrance where you might not want to track dirt into the house, or serving an outdoor pool. Adding a simple shower stall is a good idea for a half-bath next to a home workout area. The premise is convenience, but don’t neglect comfort. Twenty square feet is the bare minimum; 36 square feet is more practical. More space is a luxury, but devoting too much space misses the point. Beyond the sink and toilet strive to make your half-bath more than a closet. Here’s some basic equipment: a good solid door, an exhaust fan, appropriate flooring, a towel rack with a hand towel and washcloth, a trash can, a soap dish, soap, electrical outlets, a toilet paper dispenser and spare toilet paper. Half-baths usually don’t get the wear and tear that full baths do, so fixtures should hold up longer. Half-baths can get by without fully stocked medicine cabinets, but they do need a mirror. A shelf or cabinet with spare hand towels and a few toiletries for overnight guests are thoughtful touches. 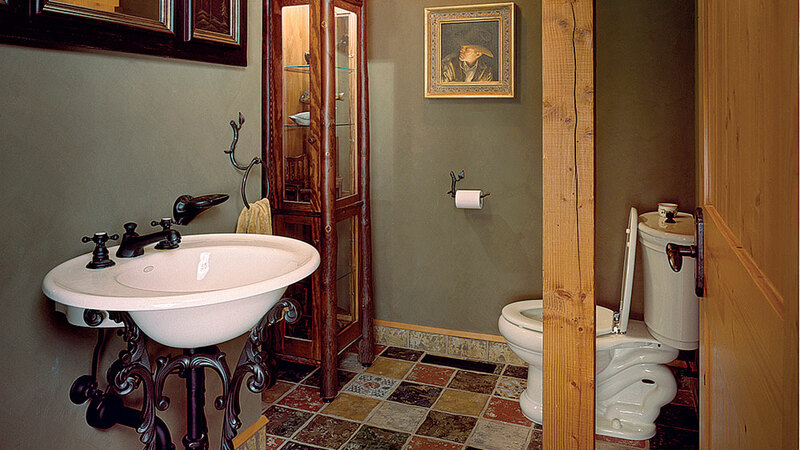 Whether your powder room is for your own use or for company, make it handicapped compatible. Besides the plumbing, you’ll want electricity and may desire heat. You can tie into the main heating system or supplement it with a small baseboard heater that heats the room quickly and cheaply. Radiant floor heating is an extravagance, unless it also covers all the surrounding rooms. Never use a portable space heater. The degree to which you decorate your half-bath will depend largely on how public a space you intend. Otherwise, half-baths offer the opportunity to express yourself and coordinate the room with the rest of the house. You can set a formal or informal tone and go contemporary or vintage, even whimsical if that’s your wish. Some guest baths add a urinal to the sink and toilet or feature a novelty toilet-paper dispenser. However you decorate it, strive to give it personality. Walls can be painted, papered or tiled. Flooring can be plain or fancy. Just be consistent with your overall approach. 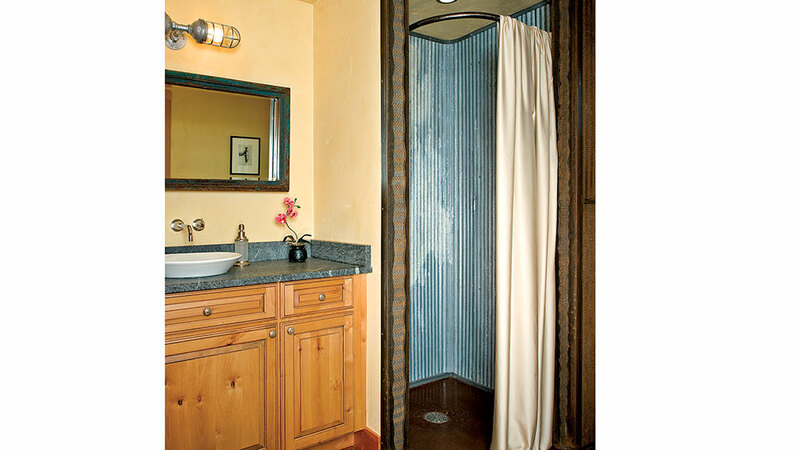 Because half-baths are small space, color can transform them from cramped to cozy. Artwork on the wall will enliven the look, but make sure it’s in keeping with the scale of the room. Timber-framing a half-bath seems extravagant, but some wood is good to tie into the timbers outside the room. 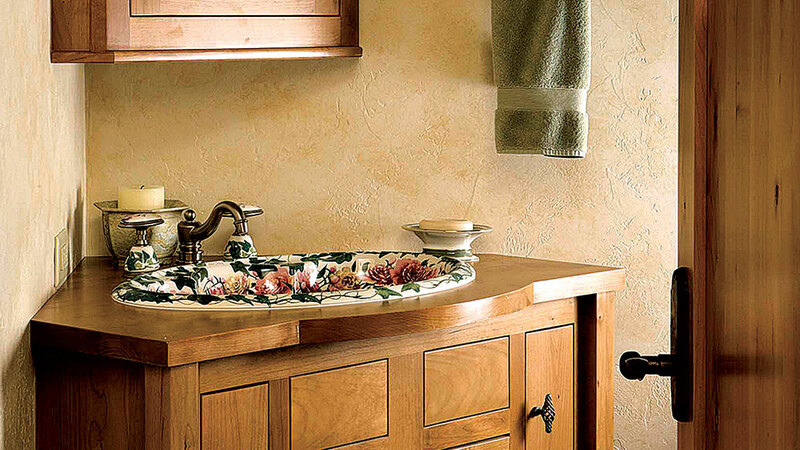 For smaller rooms, consider a corner sink. For larger ones, add shelves or cabinets. The toilet-sink combo is the powder room’s raison d’etre, but you could add other stuff. You might have a linen closet, convenient for whoever uses it and to keep spare bedding and towels from a bedroom bath, giving you more room for dressers, chairs, shelves, windows or patio doors. Powder rooms can take a load off other rooms and provide great storage for out-of-season gear. You’ll be the judge of whether a reading rack is an amenity or a necessity? Stock it suitably: nothing offensive or weighty. A window can cheer up a half-bath by adding natural light to perceptually enlarge the room. The determining factor, though, is view vs. privacy. Think about shelving and plants (especially if you have a window). One final thought. Once you determine the role of the half-bath in your home, you may decide that two half-baths will suit your circumstances. This arrangement works well in homes with multiple levels, such as one serving a lower-level family room, game room or media room, and a second for visitors on the main level.